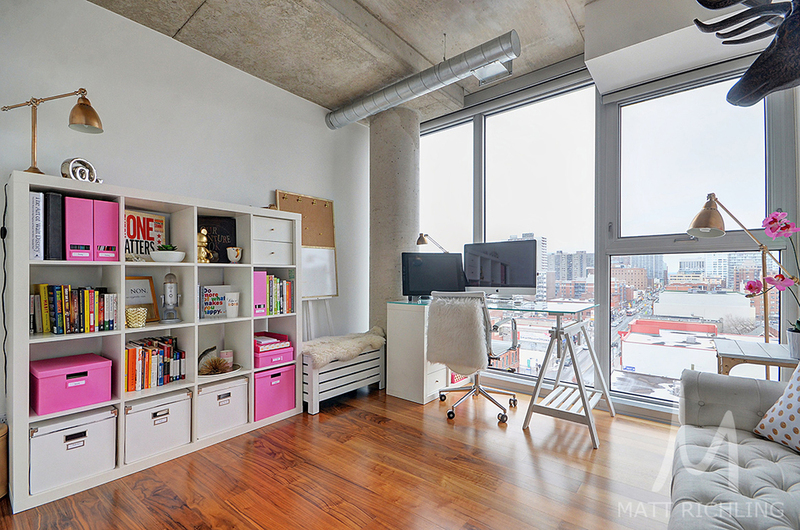 The Ottawa skyline has never looked as stunning then from the living room of this sub-penthouse corner loft. Wrapped with glass and filled with light, you will savour each sunset and watch the city sparkle. Looking for a two bedroom that stands out? The master bedroom boasts an upgraded walk through his/hers closet and dressing area which includes plenty of space for all your shoes and handbags. The private en-suite bathroom complete with a deep "soaker" bath tub and clean white quartz counters. Your large master bedroom is perfect for those who prefer the oversized king mattress, with plenty of space to spare. The main living area features a copious amount of space for cooking, entertaining, and dining - whether for a larger celebration or an intimate party of two. The kitchen is finished with upgraded clean white quartz countertops, stainless steel appliances, tiled backsplash and plenty of additional storage space in the island. The feature wall is characterized by an upgraded exposed brick that is a perfect backdrop for any art collection. The second bedroom can be used as an office, den, or proper second bedroom. A second full bathroom is located just off the main hall and includes a fully tiled shower, dual flush toilet, and vanity with clean white quartz counters. 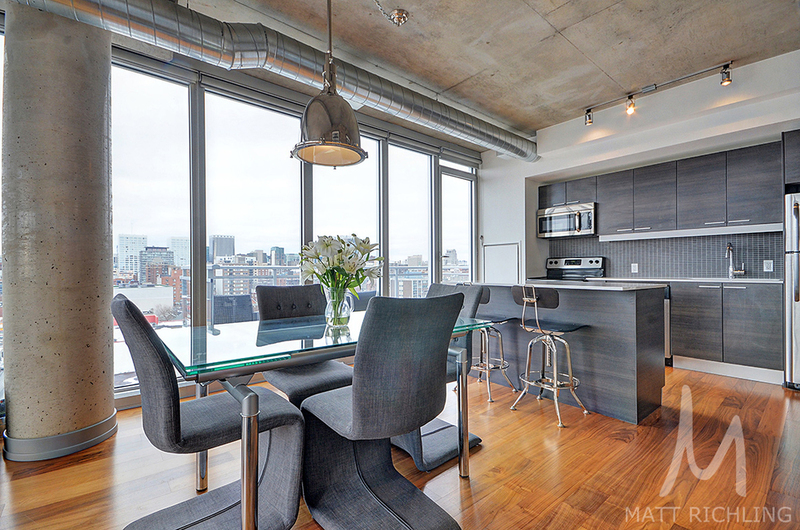 What makes this unit extra special are the features provided by being the sub penthouse unit. Features such as extra high exposed concrete ceilings that provides more interior space and extra large floor to ceiling windows. The building features once of the largest amenity rooms along with the luxury features you would expect. 17-foot entrances and lobbies, executive concierge, exercise room with free weights and cardio equipment. The lounge features a large twelve person dining table, kitchen and bar, billiards table, and media room with large projector and surround sound. The interior courtyard features outdoor seating, bbq area, and lush green landscaping. Not only does the building have luxury amities and unique history in the city, Central was built to have a green future. A LEED Silver certified building, it is among Ottawa's most environmentally advanced condominiums. A few of the features include a green roof with rainwater collection for on-site irrigation, building recycling system, low and energy saving faucets and appliances, the list goes on. Located in the heart of Centretown, at the corner of Bank Street and Gladstone Avenue, the building was named due to its central location. A few blocks to the north and you have the city's downtown and parliamentary precinct, a short walk to the office. Two blocks to the south is the Glebe - Fashionable, hip, one of Ottawa's top urban neighbourhoods. And surrounding the building you have a budding district of shops, restaurants and leafy residential streets. At the base of the building you have Starbucks, Shoppers Drug Mart, and the LCBO. A little further and you have some of the top restaurants (Fauna, Whalesbone, El Camino, Datsun, Union 613, Town etc) and shopping in the city (Nordstrom and the Rideau Shopping Centre). Offered at $469,900 with a flexible closing date available. One heated underground parking spot is included along with one storage locker. For more information or to schedule a private viewing, please contact Matt Richling (sales representative, RE/MAX Metro City Realty Ltd.,) by clicking here.